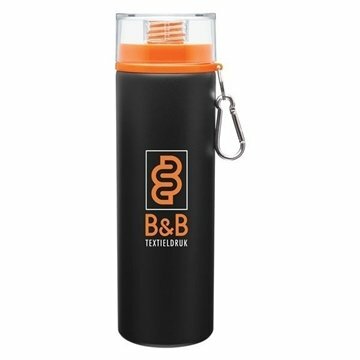 28 oz single wall aluminum bottle with threaded dual-opening lid, colored accent spout, carabiner, and key ring - carabiner and key ring polybagged inside bottle. thank you for everything People is very happy when they receive a stress ball, and students come back to our center to get more to help them focus during tests. Everybody thinks they are great! Love them! This really is my personal favorite - something that's so handy and helpful. I know that my customer will be very please. I was very pleased not only with the quality of the product and reproduction of our logo, but also with the outstanding service we received. Good job on artwork we posted. Rose who handled my order was extremely helpful and very quick to answer my questions and the delivery time was very fast.. the staff at AnyPromo.com are very efficient, helpful and professional.